Rain or shine, it was a jolly good time. 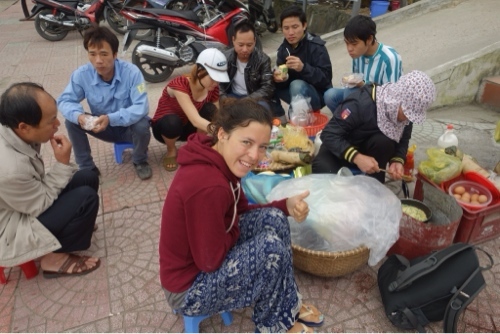 After another terrible night bus we arrived at Haiphong, Vietnam’s third largest city. After missing the morning boat, we retreated to a coffee shop until the next one at 1:30pm, enjoying a breakfast of pork buns and doughnuts. 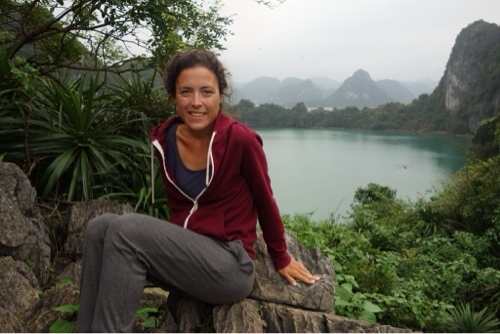 We had decided to explore Halong Bay from Cat Ba Island instead of taking one of the organised tours from super-touristy Halong City as I had heard from others that Cat Ba, Halong’s biggest island, is far nicer. 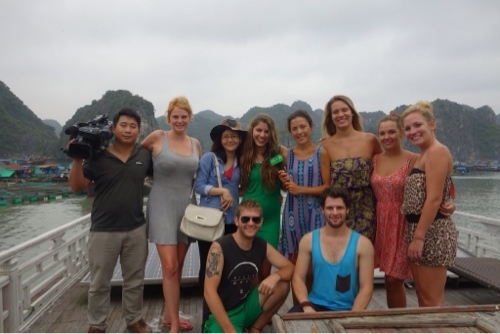 They were right, Cat Ba Island boasts rich jungles and superb scenery and the town itself was charming. 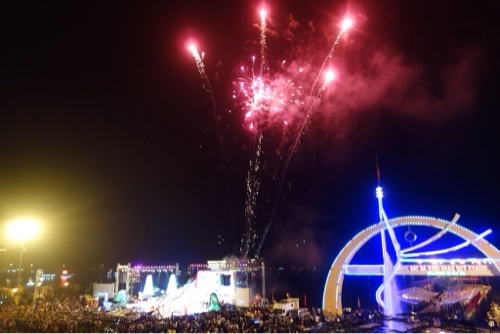 We just so happened to be in town for the annual festival celebrating the date that Ho Chi Minh visited the island and were lucky enough to watch the dragon boat race followed by an impressive performance and fireworks that evening. After a few hibiscus flower cocktails at The Good Bar, we retreated back to Mr Zoom Guesthouse which is comfortable, clean and provided free breakfast, much nicer than Cat Ba Hostel where we stayed on our final night. As there was a group of seven of us we had arranged to charter our own private boat from Cat Ba Ventures who are recommended in Lonely Planet. A guy called Sven from Switzerland asked if he could join us on our trip and we were more than happy to have him onboard. Surprisingly hiring our own boat wasn’t too expensive and far cheaper than the booze-filled Castaway trip, popular with backpackers. We arrived at the dock bright and early after a scrumptious local breakfast and were flabbergasted at the size of our boat. After we had explored our twenty sleeper boat with huge double bedrooms, hot showers and met our crew of four we realised why we had got lucky. A film crew was on board and wanted to ask our opinion on solar-powered boats like ours to broadcast on the news as part of Tourism Week. Jaimie, Pheobe and I jumped at the chance to appear on TV and spoke in front of the camera before the film crew packed up and left us alone on our massive boat. 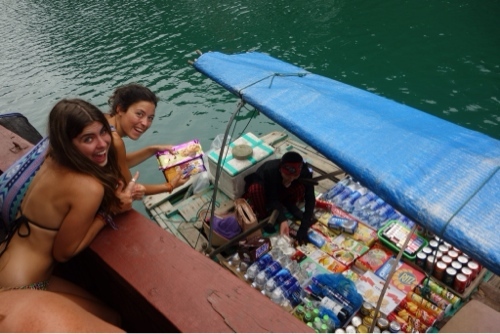 We cruised around the beautiful Lan Ha Bay before stopping for a buffet lunch prepared by our crew. The food was incredible and it just kept coming. 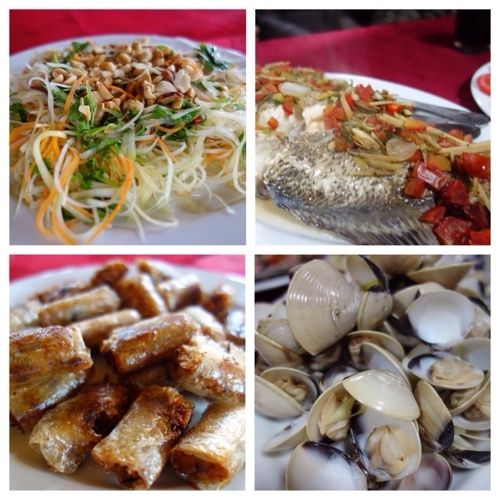 I particularly enjoyed the grilled herb infused fish, papaya salad and spring rolls. Each meal was plentyful and extremely well cooked. 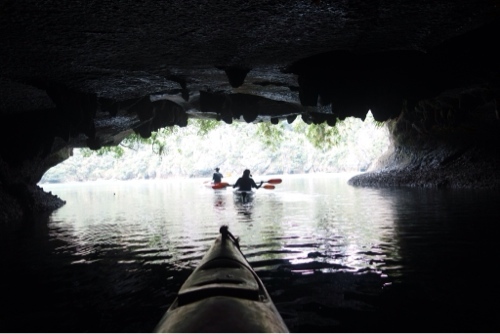 After lunch we jumped in kayaks to explore a nearby cave and climb to the top of a small island to admire the views across the bay. 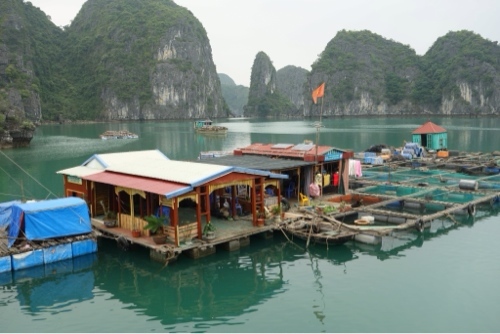 Our guide Hung made sure we went off the beaten track and we rarely saw any tourist boats apart from on the last day when we visited the famous Halong Bay which as beautiful as it is, has been overrun by boats filled with tourists. The rest of the afternoon was spent lazing on sun loungers and chatting away. Stocking up on more sweet treats! Before embarking on our trip we made up a challenge in which we each had to bring along a snack worth up to $1. The snacks were placed in a black bag and we went around the table pulling them out one at a time guessing who bought which item similar to secret Santa. Everyone correctly guessed that I bought the toffee pastry cake! That night after another fantastic feast we played cards whilst drinking vodka and watched in awe at the fascinating bright plankton which lit up the dark sea. 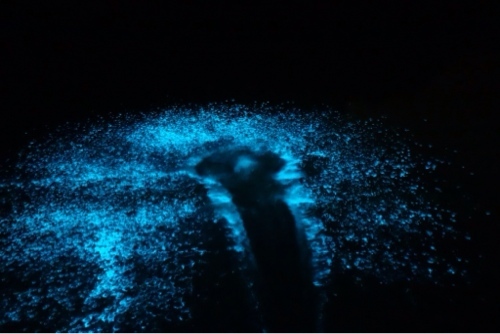 I played with a fishing line which made colourful swirls of blue light caused by the plankton moving. It has never seen anything like it, it was truly amazing. The next day was similar to the first; cruising the islands, relaxing on deck and enjoying some delicious food. We kayaked for over two hours exploring some of the many lagoons in search of some rare monkeys (only 64 left!) but unfortunately just found the common species. 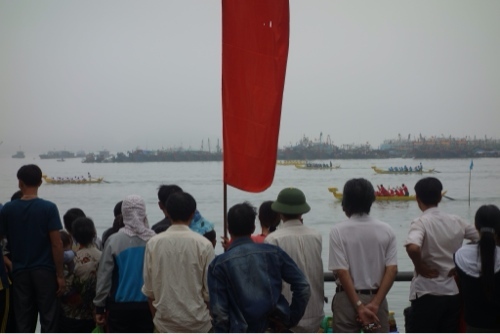 We had to make it back to Cat Ba a little earlier than planned due to the thick fog that was coming in. 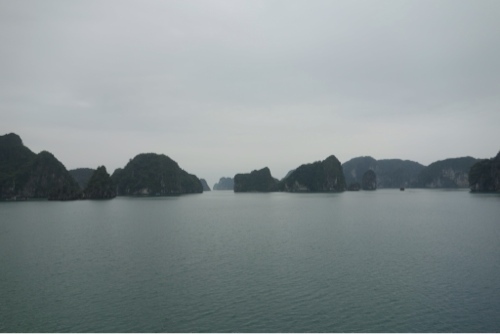 Halong Bay is notorious for bad weather but we were lucky enough not to see rain and be just a little overcast. Bright blue skies would have made our trip and photos perfect but I count myself lucky that I was able to explore one of the many natural wonders of the world on my own private boat with a great group of friends.